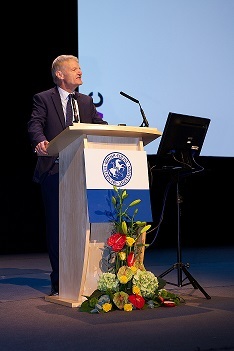 RCVS Council member and Former BEVA Council Member Professor Stephen May has been elected as the College’s Junior Vice-President for 2016-17 and will take up his role at this year’s RCVS Day on Friday 15 July, pending the outcome of this year’s RCVS Council election. Professor May was elected to the position by his colleagues in Council at its meeting on Thursday 3 March and will replace the outgoing Junior Vice-President Chris Tufnell, who will become President of the College for 2016-17. Professor May was an appointed member of Council, representing the Royal Veterinary College (RVC), from 2001 to 2010; has been an elected member since 2012; and is expected to serve as RCVS President for 2017-18. Stephen is currently Deputy Principal of the RVC having worked there since 1993 in a number of positions including Head of the Farm Animal and Equine Clinical Department and Vice-Principal for Teaching. At the same meeting of RCVS Council, Professor Susan Dawson, Head of the School of Veterinary Science at the University of Liverpool, was also elected by fellow Council members to be Chair of the Education Committee. She will replace the current Chair Professor Jo Price who leaves the position, and RCVS Council, in the summer to become Vice-Chancellor of the Royal Agricultural University. Professor Dawson has been an appointed member of Council since 2011 and has served on the Education Committee for five years. At the March meeting David Catlow was also reconfirmed as the Chair of Standards Committee.